For our final post in the favorite films series Kirk Fernwood of One Film Fan chose a different approach. He shares each of the Christian movies he saw this past year and explains what he liked about each one. In a time when society seems to be falling apart and filled with so much overt hatred, violence, and self-centered mentality, it’s a necessary thing to have films released that offer a much more positive, faith-based perspective to illustrate that there IS genuine love, hope, peace, fellowship, and grace that is real, attainable, and ready to be sought after and given. As a film critic, I take in a wide variety of genres and themes over a 12-month period, but in 2016, the 12 faith-based efforts available to me, whether in the theaters or sent to me directly via DVD or online screeners, came as wonderfully timed beacons of God’s light over the course of the year, and presented His message via a myriad of narratives and performances that very much showcased how much the quality of Christian films has improved, as well as how many more efforts are being released theatrically over the last few years, ideally for the whole world to view. 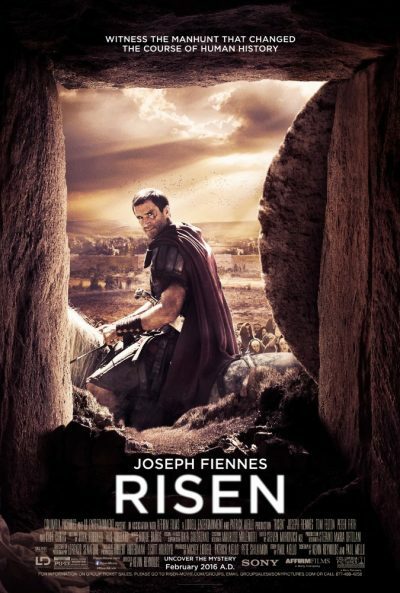 Risen– Greatly benefitted via the incredibly unique approach of telling the story of Christ’s resurrection through the eyes of an unbeliever, a Roman solider, whose journey to redemption was impactful and moving. High quality in actors and writing made this film soar. 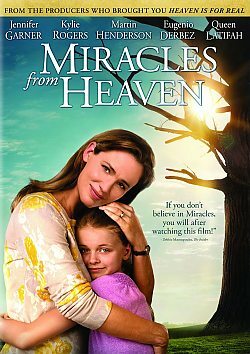 Miracles From Heaven – I always feel drawn to true stories, especially when they are truly miraculous narratives like this one, about a young girl whose life could have been over—twice—yet God’s amazing hand both saved and healed her. Again, strong cast, solid story adaptation, and a blatant yet approachable delivery helps send this story straight to the heart. God’s Not Dead 2– Relevance to ongoing societal issues. The raging debates about God being taken out of so many facets of the national scene is current and important to address, and this second installment of the “God’s Not Dead” series doesn’t shy away from presenting a narrative about a teacher standing firm for her faith in the face of the odds and those who stand against her. It’s the in-your-face delivery here that makes the biggest impact, which sometimes, is the best way to tell God’s truth. But, it isn’t meant to bash people over the head either, it’s just the hard facts found in real life when it comes to faith. Yet another solid cast involved as well. Ben-Hur– While not in itself an official “Christian film”, the story of one man’s quest for revenge that, while true it is what is sought after, ultimately leads him to encounters with Christ and the notions of unconditional love and forgiveness, and that is the root message found here. It’s a more subtle approach on the surface, but also makes the film relatable overall when it comes to telling others about God’s love and forgiveness through the Cross. Hillsong: Let Hope Rise– The reality factor is what drives the spiritual potency of this excellent documentary that clearly shares the heart of those primary members involved with the Hillsong United worship band and their personal journeys of faith while facing the enormity of what the world deems success and achievement. Here, it is the testimonies and the down-to-earth, humble, thankful demeanors of those involved that make this a perfect picture of the fact these hugely popular Christian musicians aren’t money, performance, or ego-driven, and that their “success” is strictly founded on the amazing opportunity they have been given to be worldwide vessels for God’s purposes through worship. That straight forward message along with getting a behind-the-scenes look at what it is to be a part of a worldwide ministry is very engaging but, again, accessible to everyone. I’m Not Ashamed– Real life rules again in this absolutely inspiring, though powerfully sobering, portrayal of one girl’s transformation and the impact it had on her fellow students leading up to the horror that was the Columbine High School shootings. Taken directly from entries in Rachel Joy Scott’s diary, the strong cast, fantastic script adaptation, and genuine heart behind this effort hits home and it’s another example showing that Christians aren’t perfect–they’re human, they struggle–and I feel that’s such an integral facet to show, as so many in this world often scoff at believers, thinking this IS the attitude presented. Moving to the independent realms, via films seen on either DVD or otherwise via screeners sent to me directly from the filmmakers themselves, we do find lower budgets and some quality issues technically and/or with acting, in an overall perspective. However, if willing to look past some of that to the greater message being conveyed, this is where they still shine just as strongly as their theatrical counterparts, though sadly won’t necessarily get to be seen by nearly as many people, as distribution costs money as well. Take for example prolific writer/director/producer Donald James Parker, who actually represents 4 of the 6 indie faith-based films I saw in 2016–Best Friends Recycled, Love Waits, Mission: Improbable, and Old Rugged Cross —this once again is strength of the intended message that carries the projects and makes them noteworthy. Now, just being frank, some critics out there might totally dismiss these films out of hand after watching, perhaps only wanting to cite the lower budget look, feel, and acting involved. While my own experiences via comparing these to theatrical releases might have had me wanting to go that direction as well, it didn’t happen. The pure heart, honest, realistic tone, and totally Bible-centered messages his films carry are what’s important, and if that means a sacrifice of technical or acting quality, so be it. I think that is the key to any small budget film efforts—be willing to look to the heart of what the filmmaker is trying to say, and other things can very much be forgiven. Plus, in Parker’s case, he actually gets some very decent actors in his work, who you can just tell gave it all they had to make the film as best as they could in order that God’s word and teachings are demonstrated. The other two films, “Only God Can” and “Yellow Day”, certainly had larger budgets behind them, but still only limited release in theaters, rather mainly focusing their efforts via On Demand channels. The strength of these two films also comes from not just quality acting, but from their sincerely human approach to the message of faith in God, allowing there to again be illustrations of people, even Christians, having inner and outward battles while holding on to, or sometimes questioning, their faith. This is effective as mentioned prior because the moment this world smells we’re being fake, they’ll know, and they’ll turn the other way. In the total scheme of things, it truly has been the marked improvement in the literal budgets, acting, writing, directing, and forms by which the Christian message is presented that has suddenly caught a second wind and is offering a quality not previously seen in the genre. I feel the more popular these films become, the more we will see have the chance to shine IN theaters and very much take advantage of using the medium of film to be a refreshed means by which to deliver positivity and the blunt truth in love this Earth needs so desperately.